Lee Avenue is one of the oldest and most historic streets in the Beach area. Originally it was called Kew Avenue after Kew Gardens, which is on the west side of the street, and which in turn was named after the Williams family, some of the earliest pioneers in the Beach. Politically, Lee Avenue covered three different jurisdictions 120 years ago. The street from the lakefront to a point about 60 metres north of Queen Street was in the City of Toronto. From this point to a spot just past the present Williamson Road was called the township of York or Norway. From that point north was the town of East Toronto. Now that I have everybody confused, let’s proceed. In the early 1880s Walter S. Lee purchased 20 acres on the east side of Lee for his summer residence. Lee was a wealthy businessman whose main abode was in the city. He served on the Board of Education for over 40 years and was involved in many charitable causes. He petitioned the city to name the street Lee Avenue. On the west side of Lee, Joseph Williams, a retired British soldier, purchased a considerable amount of land. Williams wanted to turn his section of land into a duplicate of the famous ‘Kew Gardens’ in London, England. This didn’t materialize at the time, because of a lack of funding. Williams started using his property as a picnic area for the citizens of Toronto. Because of the beautiful grass, water and sand, it soon became a cottage and vacation retreat. Williams, along with others, started to rent areas for weeks at a time. Later on cottages were built on the lakefront and on Lee Avenue. In 1902, Lee died and his property was subdivided into cottages, later permanent homes. From that time on, both sides of Lee Ave was lined with houses and cottages. One cottage was built for $850, imagine the cost now! In those days the cottages started at the bottom of the street beside the lake, starting with number 1. The city bought Williams’ property for a public beach, and later a park called ‘Al Frescoe Lawn’, which was used as a lawn bowling green, skating rink and featured a clubhouse at the lakefront called Kew Beach Clubhouse, housing boats and social events. The city eventually took over responsibility for lawn bowling, skating, swimming and other activities, and moved these recreation facilities to the west side, where they remain to this day. 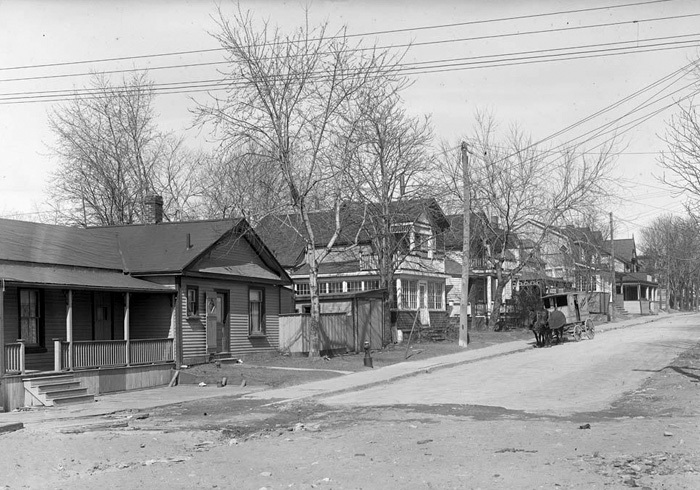 Houses on the west side of Lee Avenue in 1930, where the Kew Beach Lawn Bowling Club now exists. On the west side of the street most of the houses were demolished. The city left only one – the Kew Williams house. It is the only one left standing and was used by the city as a groundskeeper’s house. The intersection of Queen and Lee has always been commercially and financially the heart of the Beach. On the southwest corner is the historic Toronto-Dominion Bank building, which is now a Coles book store. On the southeast corner was the first Tamblyn’s drug store; now we have Bell and the Royal Bank. The old Family Theatre was also located there. On the northwest corner stands Foodland, originally a food store, at one time I.G.A. It is one of the few old buildings with a metallic ceiling inside, and there is now a lovely mural on the side of the building depicting the history of the Beach. On the northeast corner stood the Wooden Bell building (later moved up the street). The location became another bank, now TDCanada Trust. One of the first electric streetcars came to the intersection of Queen and Lee in the early 1890s. Just to the west is the Beaches Public Library, which has stood for nearly 100 years. This corner will remain the heart of the Beach, as long as we don’t allow any repressive development to encroach from other sections of our beloved Beach. Lee Avenue originally started at the lake and in 1902-03, the numbers on the east side started at 1 – they stopped at the new street called Alfresco Lawn, so when the city took over the parks, the numbers started at 9, where the current street begins. 9 – A fine example of a Beach cottage.At one time these could be built and bought for $500-750. The recent sale price for this home was $1,250,000. 11 – Blarney Castle, owned by Edward Martin in 1920. Here is a wonderful example of Beach architecture with its green and yellow colours, quite unique. 31 – Hotel, owned by Wm. Thompson. A fine large example of one of our summer hotels in the Beach which has just been renovated. 37 – Manuel Gebertig was one of the original members of the Beach Synagogue and one of the original owners of the movie theatre. 30 – Kew Williams, the son of original pioneer Joe Williams, built his honeymoon cottage in April of 1902 for his wife with stone and wood from around Kingston. It is one of the last homes of the Williams family and a beauty beyond comparison. 43 – This was the residence of one of our local architects, E.R. Babington, who built many of the cottages in the area. One of his most noted is on the southeast corner of Queen and Leuty. 55 – Here is a monument to averted disaster. A 22-storey apartment building was to be built here in the 1960s, but common sense prevailed. Beachers stopped it, and now we have this little apartment building. 59 & 71 – The Clayton family, original Beach butchers. This is a tribute to one of our pioneer families who were some of the original ‘purveyors on Queen’. 75 – Hooley Smith house. Reginal “Hooley” Smith was the Wayne Gretzky and Gordie Howe of the days after the First World War, said to be one of the greatest of all time, and also a Beacher. Kew Gardens – Wm. D. Young memorial fountain. The fountain is a tribute to a doctor who treated the sick and infirm and in many cases never charged them. He died helping a young soldier during the First World War, after contracting a disease from him. He is the epitome of a doctor who helped all Beachers, the sick and the poor. 97 – Bell Telephone building, St. Michael’s College. In this location over 100 years ago the Beaches Exchange was built, and remained for many years. It became St. Michael’s College during the 1930s. Both moved, but the building still stands as an apartment building. 114 – Farm house. This site was the location of one of the original farm houses on Lee, when the area was still farmland. 120 – G.W.V.A. On this part of Lee, the original Great War Veterans Association in the Beach was formed, later moving to the Kingston Road and Woodbine branch. Both buildings have since been demolished. 126 – Joe Price was one of the leading developers in the Beach, building the Price development between Leuty and MacLean. This house is the most stately example of Beach architecture. More will be written on Price. 125 – An original house on Lee, altered with its verandah. 141 – Another century house distinct in its appearance. 144-6 – These two houses were originally one. 150 – William and Edna Houston house. William (Bill) Houston was a sports legend in the Beach, married to Edna. Bill was the last general manager of The Toronto Maple Leafs baseball team, and was a lifelong friend of the owner. 168-80 – Allendale. Anthony Allens was a wealthy manufacturer who built the ‘brick cottage’ with its own lawn bowling area on Lee. Alas it was razed and a few other homes were built in its place. 207 – Another early example of the oldest homes on Lee in the former village of East Toronto. 235 – Albert Flowers was the gatekeeper to the Ames estate. Much of the land at the north end on the east side of Lee belonged to A.E. Ames, until the building of new homes after the second world war. 304 – This is one of the most elegant houses on Lee. Originally it belonged to John Ward. It later became Victoria Hospital, a private facility where many Beachers were born. It was run by nurse Zelak Ward. Today it has not lost any of its historic lustre. It has a little private/public library in the front and a sun dial on the side. Lee Avenue wouldn’t be as historic if it wasn’t for two people: Rev. Walter Stewart Darling, a minister who first had a summer place at Kingston Road and Lee; and later A.E. Ames, a wealthy stockbroker who made this his summer home, one of the most picturesque homes in the area. Ames would entertain the Governor General of Canada for the week of the Queen’s Plate at his estate named ‘Glen Stewart’ a hundred years ago. He would open the Queen’s Plate with the Governor General and the horse guards – they would deploy from his estate down to the Woodbine Race Track for the regal event. Mr. Ames was also a fitness buff on his estate. He opened up a golf course called ‘Glen Stewart’ which he allowed to become the first public golf course in the city of Toronto. On his estate he also had a large pond filled with fish and fowl. Many old-timers referred to his property as ‘Ames Bush’ and ‘Ames Pond’. I could write for another 20 pages on Lee Avenue, but that’s for another column. I lived with my family at #51 Lee Ave then #65 Lee Ave during the 40/50/60/70/and Mom sold the house at 65 in 1988. These homes were build by my Great Grandfather Wm. Forbes who also built the Fire Hall on Queen and Woodbine. A friend of mine sent me this e-mail and I am very glad. I lived at ther Beach until I was married in 1965…the Beach will always be my “heart” home. Hello Penny – I was wondering if you were the Penny I knew. I was a friend of your sister Trudy. She was at my wedding. I married Ralph Waites. I still live in the Beach on Elmer Avenue. Your mom was a great lady. She was a lawn bowler as I am. Thanks for bringing some memories back to me. Regards Jo. Gene – your knowledge and research materials on The Beach always astound me! The Joe Price who lived at 126 Lee was my great grandfather. I’m dying to learn more about him. Me too! I am interested to know if he developed the houses south of Violet on Lee Ave.
Walter Sutherland Lee was my 3rd great uncle. The next street over was named after his wife, Emma Mary Leuty, as was the life saving station. Lesser known is the origin of Violet Ave. between Lee and Leuty. It was named after their grand daughter, Violet Gooderham Lee. I’ m not as certain of Alfresco, but I suspect it was a play on the name Alfred, which appears in that branch of the Lee and Gooderham families. Ed – I think that the Foodland store dates from the 1930s or 40s – it is an Art Deco supermarket and obviously any store from before 1898 was smaller and has been demolished. I am sure Gene has knowledge of this if you contact him directly. My mother bought 117 lee ave in 1955 and lived there till 2002 the store in 1955 was a Kresge store with a front entrance on Queen St and a side entrance on Lee Ave to the lower level which was their basement. On the north east corner was Woolworths were I worked part time as a stock clerk at 12. Hope this is some help to you. I sure miss those times. From early 1958 until the 1990’s. I lived at 55 Lee Ave. from 1977-1984. The heating was abysmal. the rent was way over priced. The maintenance was non- existent . The only thing that made the rent worth while was the neighborhood and all the characters that lived in the building and on the block. comedy book on all that took place in and around that building. We finally moved after the fuse box inside the front closet went on fire. I now wonder how this building ever got a pass by inspectors to open. I still miss it. Thanks Gene. I remember I was looking for a house back in 77 and it was located on Lee Ave. the lady’s husband had passed away suddenly and she could no longer afford it, I forget what number, it was near Williamson rd. and on the west side it was a semi detach and had no parking, now as for the north east side of queen there was Woolworths on the corner and Kresge’s was right next door to it, where shoppers drug mart now stands, Kresge’s went belly up first then Woolworths closed up. also on the south side there was at one time a movie theatre there and a pool hall upstairs above it I used to play pool there and some lady ran it, I always remembered it as a bank down stairs. The Movie theatre was the Family and then the Lake Theatres. I am not sure in which order. Went there and the Fox all t he time. I don’t know who that older gentleman was and I never saw him again. I lived at 63 Lee Ave. back in 1972. This is the home that Norman Jewison, back in the 30’s grew up in and attended Kew Beach School and Malvern and eventually U of T. His folks managed a convenience store and post office. in the late 40’s and early 1950’s I attended Kew Beach Public School and Malvern CI, too. We lived at 1906 Queen Street and to our east on the south side of Queen Street at Kippendavie Avenue was a dry goods store owned by the parents of Norman Hewson. Just west of that was a Sottish bakery that had the best long chocolate covered donuts, which we enjoyed after coming back from a woodworking shop class at Norway Public School. The first time I ever came into Toronto ( a new immigrant staying with relatives in Streetsville), I took the Grey Coach in to town, walked down Bay to Queen, and had my first ride on the Queen Car, getting off at Lee Avenue and walking down to #15 where a woman I had met on the ship coming over, lived. Among other things, she took me down to Kew Gardens to feed the ducks. My first night in Toronto was spent at 15 Lee Ave. It’s 5o years ago but I remember it clearly. I lived at 15 Lee Ave. and moved as a kid from there in December 1965. Our family rented out the third floor from 1955-1965. we had tow ladies live there for quite a while Susan and Margret from England. I went to Williamson Road Elem. from Jr. Kinder- 6th grade. Did ayone used to live at 105 Lee’s Avenue? And if so would you have any old photos? Would love to see them and possibly come to toronto…if I may get copies!! Thankyou so much. Hi Susan, my Dad and his family lived at 105 Lee Ave! The only photo I have is of he and my mother’s engagement photo taken in the backyard! In 1930! I lived at 332 Lee Ave. For about 30 years. My family the Gibsons’ aunt Nancy Right and Grand Mother Caudle all lived in the Beaches and on Lee Ave. for over 50 years. Children: Don Bob Lawrence Barbara Paul John and Allan Mom Phylis Dad . Henry The children all attended Williamson Rd. School. Malvern CI and Danforth Tec. my mom went to the High school of Commerce, in the east end of TO. I was a prominent athlete at Williamson/Glen Ames and Malvern. Winning the first ever Inter team football trophy that is still at Malvern. I live in NB now and would love to hear from any old Beaches residents. My grandparents lived at 328….Fulcher was their last name. Wonder if you remember them at all. My grandparents lived at 328….Fulcher was their last name….wonder if you would remember them. Well Allan, I forget how I arrived on this site but find it very interesting to read all this old familiar history and to my surprise I find one of the nicest guys my older brother John had as a friend. I was looking at a realestate listing of our old house on Wheeler to find it last sold in 2018 for $1.67 millions, our great grand father built it for $900.00 . I remember you being a great athlete. A couple of years ago I was sorting through old photos of all the local guys playing hockey on our little back yard rink my dad used to put in each year and you are in them along with the Donnans , Walkers and my best buddy Doug Smyth who I have re-connected with on face book. John lives in Whitby now with his wife, still very much an athlete too, still running marathons and biking at 71. My wife and I also left Ontario 2 years ago and reside in Gaspereaux PEI Panmure Island Area which is on the Northumberland straight. The beach here always reminds me of growing up in the beach when I was a kid. Were going back for our annual visit to Ontario in May so I’ll be sure to let John know we spoke. My mom and dad bought the house at 121 Lee Avenue in 1969, I believe, and still live there. My brothers and I all grew up there. My mom was saying yesterday that she thinks the people from whom they bought the house had 8 girls. I found this webpage when I was looking around to see if I could figure out who that family was, and if any of them would ever like to see the house. My dad’s not doing so well anymore and my mom is having a hard time too. I think it might be meaningful to her to meet the people who lived there before us, because it will help give her some sense of the house continuing through time, even if one day she has to leave it. I think the house was built in 1905. The back of it was renovated in the 80s. It’s declined badly over the last 20 years, for financial and other reasons, but it’s still quite a beautiful house. Too bad none of my brothers and I could actually afford to buy it from my parents at market value when the day finally comes when they can’t live there any more. And it’s so big and so much work that I’m not sure any of us could justify living there anymore, at least not without a big family. I hope one day it will be restored to its full beauty. It would make my mom so happy to know that it was cared for. Good times….I was a kid and sold popcorn and pop at the baseball diamond. Bought my first Christmas present for my Dad at Woolworths………………..
Great reading all the.memories my sister and myself live in Kingston. The Beach was so homey we went to Norway Public school and then Malvern . Grew up on the Boardwalk learned tennis at the courts. My sister stayed in the beach running an antique store on Queen. Unfortunately the atmosphere changed and the whole are became too expensive. We come home occasionally to walk the Boardwalk. I still have my old Once a Beacher t shirt I see the spirit still lives. Hello, I was wondering if you know anything about the house at 304 Lee Ave. My mother was born there. It is now got a plaque on it that say “kitty hall”. I can’t find any information but found this post and I am hoping you might have more information. My mother was born in 1930 and came to this house when released from hospital. My mother was born in Victoria Hospital in 1930 I have discovered. Would anyone know the reason for the name Kitty Hall on the front of the home now? We passed by it this past weekend. Thank you.